Essential Study Skills 7 Edition For students who need to develop the study skills required to successfully complete their college education--whether they attend a two- or four-year college or they are adult learners--ESSENTIAL STUDY SKILLS, 7th Edition, is their guide to success. Featuring the essential learning strategies for becoming a better student, this book helps students learn how to prepare for class, develop textbook reading strategies, use effective note-taking techniques, strengthen their test-taking skills, and carry their skills forward. 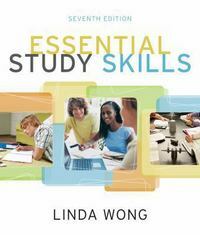 ESSENTIAL STUDY SKILLS, 7th Edition, adapts to any learning style and offers a step-by-step approach and numerous opportunities for practice throughout the textbook and accompanying website. The fresh four-color design and streamlined look engage students and emphasize the essentials.